This week, we featured the Media Centre PC, powered by the Intel Pentium 4 processor. More specifically, we had a look at sound options – the Media Centre PC has Dolby Surround Sound capabilities. That means you can have two speakers at the front, two at the back, one on both sides and a subwoofer – great for immersing yourself in movies. 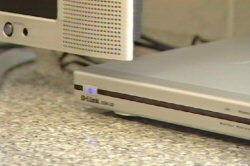 We also had a look at how wireless media sharing can work for you in your home. We featured three Acer LCD 26 Inch Televisions – one in the lounge room, one in the spare room and one in the kitchen. All three of these televisions share the content from the one Media Centre PC. Not only can the media be shared, but it can be stopped, fast forwarded, recorded and saved for next time – for example, Boris’ Mum recorded her favourite cooking show. Whilst she cooks along with the chefs, she can pause and rewind when she needs to – thanks to the amazing capabilities of the Acer Media Centre PC. The stylish Acer Aspire E500 is the top of the line choice for your home entertainment platform. We also featured Acer 26-Inch LCD Televisions, which further add to the Media Centre experience. Inside the E500 is an Intel Pentium 4 processor, supporting HT technology – with 3.4 Gigahertz. It comes with a massive 300 Gig hard drive – that’s more than 75 DVD movies! It also has 1 Gig memory, 256 Meg Radeon Graphics Card, Dual Layer DVD Drive and wireless keyboard and mouse. Plus, you’ll receive a full years onsite warranty for the computer, and a three year onsite warranty for the television. And all this for $3999. For a more mobile experience, the Acer Aspire 1694 notebook is a great choice and packed with features. It has 512 Meg of Ram, an 80 Gig hard drive, slot loading dual layer DVD drive, 128 Meg PCI Express Graphics, and a 15.4 inch CrystalBrite windscreen. It has integrated Bluetooth, built in card reader and is fitted with Intel Centrino Technology.